The 15.4 km long Ceneri Base Tunnel is the second largest railway tunnel project in Switzerland after the Gotthard Base Tunnel. Now that the Gotthard Base Tunnel is in use, it is only by finishing the Ceneri Base Tunnel that the New Railway Link through the Alps (NRLA), the continuous flat railway that will link Northern and Southern Europe with a High Speed/High Capacity line, can be completed. GCF's work on the Railway technology batches includes the design, development, building, delivery and laying of the track on concrete and ballast. The completion of this railway superstructure work is set for July 2019. To the south of the Gotthard Base Tunnel, on the line that passes through the Swiss Alps, the Monte Ceneri Base Tunnel, in the Canton of Ticino between Bellinzona and Lugano, stretches for 15.4 kilometres from the north portal at Vigana (Camorino) to the south portal at Vezia. An integral part of the NRLA, it has been built by AlpTransit Gotthard AG – a wholly owned subsidiary of the Swiss Federal Railways (FFS) – who commissioned the project under a contract with the Swiss Federal Government. Like the Gotthard Base Tunnel, the Ceneri Tunnel also consists of two single track bores with a 7.5 m diameter placed up to approximately 40 m apart and interconnected every 325 metres by cross passages. The entire Ceneri tunnel system extends for 39.8 kilometres. It has a maximum longitudinal gradient of approximately 8%: from the lowest point at Camorino, a difference in height of 110 m must be overcome to reach Vezia. 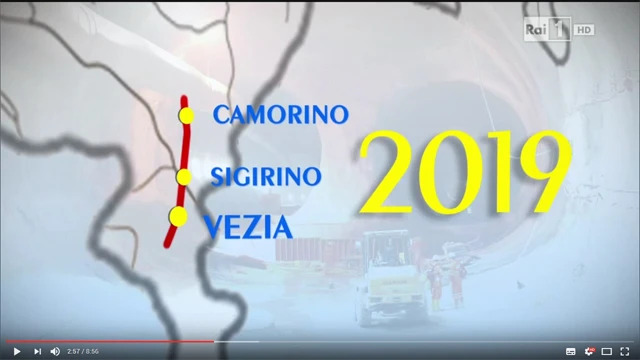 Superstructure work on the Ceneri Base Tunnel and the new above-ground routes to the north of Vigana will begin in July 2017, as soon as the construction work which is under way in Camorino has been completed. The railway superstructure for the two tunnel bores – except for a small first section at both portals – will be implemented on a concrete platform and LVT (Low Vibration Track) blocks, as already used on the Gotthard Base Tunnel. 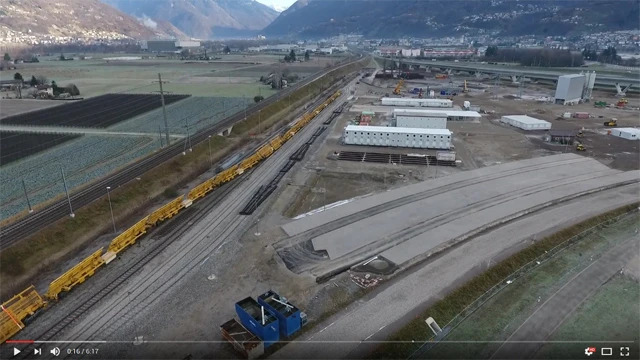 North of Vigana, on the other hand, the superstructure for two single-track viaducts over the A2 motorway and the Lugano-Locarno spur-line link – above-ground sections – will proceed with the laying of tracks on a ballast railbed. Work will last for 12 months from July 2017 to July 2018. The Technology Batch will follow and will equip the Ceneri tunnel with all the necessary utilities (contact line, power, telecommunications and radio, fire protection and ventilation) and finally, testing. 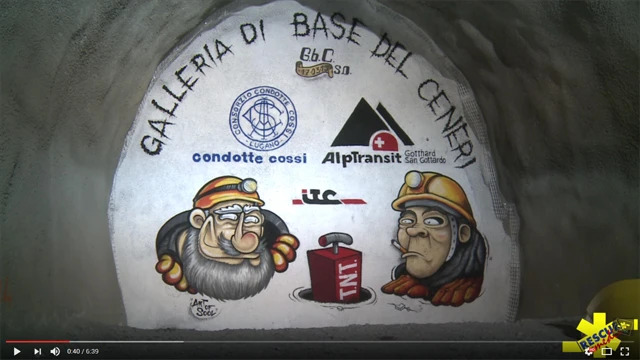 The Ceneri Base Tunnel will become operational in 2020. In the Canton of Ticino, between Bellinzona and Lugano, it extends for 15.4 kilometres from the North portal of Vigana (Camorino) to the South portal of Vezia. In order of size, the Ceneri Base Tunnel is the third largest railway tunnel in Switzerland after the Gotthard and Lötschberg tunnels. It is of strategic importance not only because it is part of the New Railway Link through the Alps (NRLA), but also because of the part it plays in regional railway links: it will reduce travelling time from Lugano to Locarno by one third from 55 to just 22 minutes. 1999: Approval of preliminary project by Federal Council. 2 June 2006: start of excavation work simultaneously in both directions from the portals of Vigana and Vezia and the intermediate heading at Sigirino. 21 January 2016: the main breakthrough of the tunnel occurred. Between Bellinzona and Lugano, the Ceneri Base Tunnel is the second largest project in the NRLA (New Railway Link through the Alps). With the Gotthard Tunnel, the longest railway tunnel in the world, it forms the heart of a continuous flat line that will cross the Alps with minimum gradients and large curve radiuses and will become the main North-South corridor of the European High Speed network. The passenger trains, with a speed of up to 250 km/h, will reduce the trip from Milan to Zurich to under three hours. The high capacity freight trains will be able to carry over 2,000 tonnes trailing load without stopping at Erstfeld or Bellinzona and without midtrain and/or pushing locomotives which are currently needed to climb the Gotthard and Ceneri mountain routes which have gradients of up to 27% on the present day lines. The strategic importance of the Gotthard and Ceneri base tunnels on the New Railway Link through the Alps (NRLA) lies with the consequences they will have on industrial and tourist development, demographic shifts, economic effects, urban and territorial transformations and the economic development of an area that extends far beyond the Swiss borders. 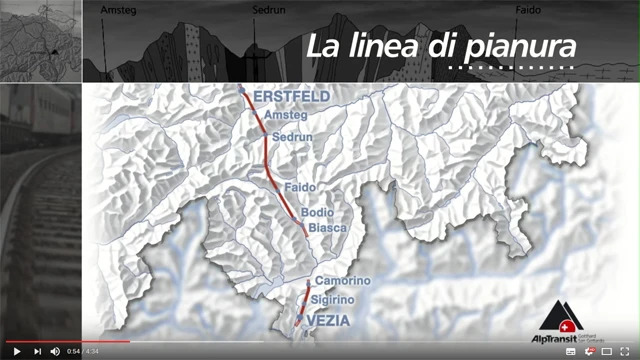 The overall project involves constructing the most efficient railway link in the world in the European belt known as the "Blue Banana", the area that goes from the Mediterranean (Genoa) to the North Sea, via the English Channel: one of the richest, most densely populated areas in the world which, with 111 million people, covers the whole of Northern Italy, part of Germany and France, the Netherlands and the United Kingdom. At present, if it is to be fully operational, in addition to completion of the Ceneri base tunnel (2020), the Gotthard trans-Alpine line needs Italy to implement its part of the Third Giovi Pass project from Genoa to Milan (2021) which will complete the high speed Genoa-Rotterdam corridor that connects Northern Europe on one side with the Mediterranean ports on the other (Lu-Mi-Med project). The main strategic aim is to move the freight traffic that now runs in both directions along the ridge between southern Germany and northern Italy onto rail. Since 11 December, when the Gotthard Tunnel became operational, freight trains increased from 140 to 260 a day with a speed of 160 km/h and an annual increase in freight transport from 20 to 50 million tonnes. When the Ceneri Tunnel has been completed and is fully operational in 2020, it is estimated that road freight traffic in Switzerland will be halved and will fall from 1,200,000 shipments/year to approximately 650,000. The estimated value added for the economy is EUR 4.6 billion per year, 44,000 jobs and a reduction of 6 million tonnes of CO2 emissions. The impact that the Ceneri Tunnel will have on passenger traffic is equally important. With 50-80 trains a day at a speed of 250 km/hour, passengers will be able to travel from Milan to Zurich in approximately 3 hours, reducing the current trip time by 25%. According to the latest report published by the International Energy Agency and the International Union of Railways, based on 2012 data, at European level (EU 27) 30.4% of CO2 emissions from fuel combustion can be attributed to the transport sector: 71.1% road transport, 13.9% navigation, 12.7% air transport and 1.5% rail transport. The transport sector produces more emissions only in the United States (34.4%): in Japan the environmental impact of the transport sector is 20.6%, in Russia 17.5%, in India 12.7% and in China, 9.6%. As soon as the new Ceneri Base Tunnel is opened and completes the project, the NRLA will be the heart of the Swiss master plan for new sustainable mobility.